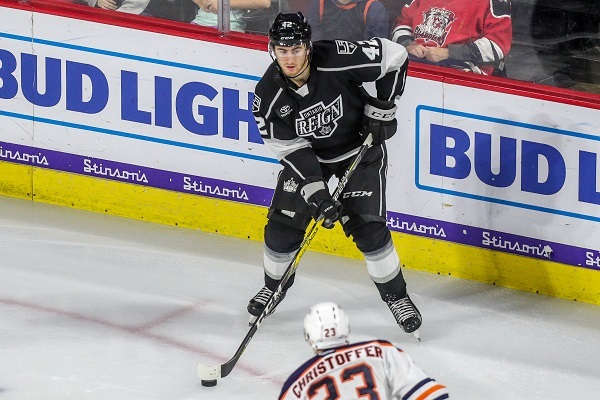 Originally selected in the first round of the 2017 NHL Draft by Los Angeles, Vilardi has been one of the most talked about Kings prospects in nearly a decade – back when Brayden Schenn was rated as the top prospect in all of hockey. It’s been a winding road for Vilardi since being selected at the league’s annual summer party. He was traded by his OHL team, missed significant time due to injury, has had more starts and stops than a New York subway train, and yet it all appears to finally be in his rear-view mirror. Just don’t count on seeing him in a Kings jersey in the immediate future. From what we’ve been able to gather, the plan for Vilardi at this point is to play two more games with the Reign (tonight in Stockton and then home on Sunday). That’s the maximum allowed under this conditioning assignment. The Kings can – and will most likely – petition for two additional contests, which would be a pair of Reign road games on December 7 and 8. From there, Vilardi needs to be on the NHL roster or sent back to junior, as he is ineligible to play in the AHL this season. As we alluded to in a recent article, and what has since been confirmed to us by two different sources, assuming Vilardi is healthy after his five-game conditioning assignment, the plan is for him to attend Team Canada’s World Junior Championship evaluation camp. That’s scheduled to being in British Columbia on December 11, followed by some exhibition games prior to the WJC starting on December 26. If Vilardi was to make the team, that tournament concludes with the gold medal game on Saturday, January 5. 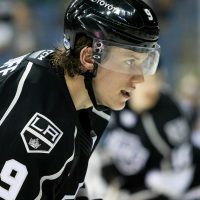 Even in early January, his future still might be up in the air because the Kings would need to decide if he’s going to the OHL or debuting with the Kings – a decision that isn’t expected to be so cut and dry. They could actually play him nine games in the NHL (without burning a year off of his Entry Level Contract) and eventually make the call to send him back to junior hockey. Man, how times have changed. Vilardi has gone from projected as the Kings third-line right winger this season to now maybe going back to the OHL. 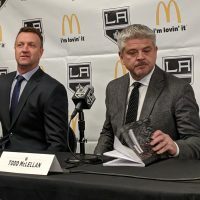 Over the summer, we were told he wasn’t going back (which former Kings forward Warren Rychel, now GM of the Windsor Spitfires believed, as well – that’s why he traded Vilardi last season). Then, just in the last month, we’ve been told the OHL is now an option once again. Sure, the injury changed things. So has the Kings play on the ice this season and the myriad of uncertainty surrounding their current roster players. And nobody in management can accurately predict where things will sit one month from now. Looked a little hesitant on first few shifts, they were also short. One nice pass down low. Nothing too memorable in the 2nd, more poise though. Very strong in the 3rd. Several scoring chances, played much quicker and seemed calmer. Per team stats (although they're never official), @Gabe_Vilardi13 played 4:30, 5:59, and 4:33… For 15:02 TOI. "We have a few guys on this team that I'm not sure what time works for them"
– Stothers went on to say that he believes the second game of the back-to-back should be the real test for Vilardi. – In his debut, Vilardi played on the third line with Zach Mitchell and Phillip Maillet. They were joined by defensemen Alex Lintuniemi and Kale Clague to form the second power play unit. 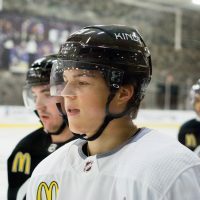 – Kings prospect Daniel Brickley took two penalties in the game, one for goaltender interference – a rather rare infraction from a player of his skill set. It was odd to see him playing down so low. – If Vilardi was returned to the OHL, there is a good chance he’ll be traded within the junior league before he arrives. Kingston holds his rights. They’re second-to-last in the OHL and recently traded their top two players. It would be unlikely Vilardi would be part of their roster for the second half the season considering his potential trade value. When is the OHL Trade Deadline? January 10, 2019. – Back to the WJC, getting Vilardi would be quite a boost for Team Canada – especially after losing Kings prospect Jaret Anderson-Dolan. 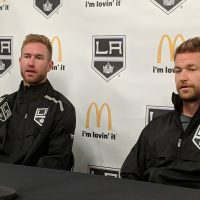 – Other Kings prospects who will potentially be invited to Canada’s camp include forward Akil Thomas, defenseman Markus Phillips, and goaltender Matthew Villalta. – Even more WJC news, look for at least three other Kings prospects to play for other countries, with defenseman Mikey Anderson expected to join Team USA, along with additional participation from centers Bulat Shafigullin (Russia) and Kings 2018 first round draft pick Rasmus Kupari (Finland). – MayorsManor will be on hand in Vancouver for the 2018 WJC and we’ll have news, notes, and quotes throughout the tournament.